If we assume exchange rates are stable, then this carry trade enables an investor to make a profit – and the profit could be even more if the investor uses leverage. Let us assume that interest rates in Europe are 0%, but the US increases interest rates to 4%. 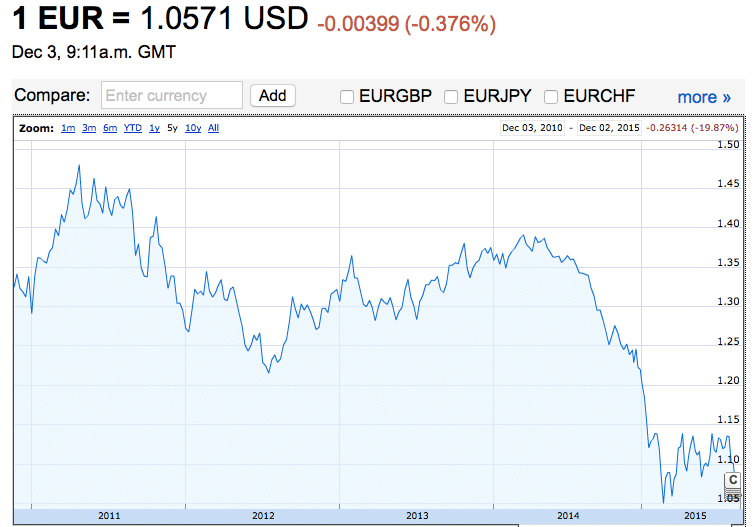 Then if you borrow £10,000 at 0% in Europe, you can invest this £10,000 at 4% in the US. This will give you a profit of £400. The risk of carry trade is an unexpected movement in exchange rates. In the previous example, we borrow in Euros and invest in US dollars. However, if the dollar falls relative to the Euro, this will undermine the profit from relative interest rates. It would take just a 4% fall in the value of the Dollar to the Euro to wipe out the profit from different interest rates. If the dollar fell by 5%, we would make a loss, despite the relatively higher interest rates in the US. On the other hand, if the dollar rises relative to the Euro, then the investor will benefit doubly. If he sells the dollar assets and converts back into Euros, he will gain more due to the appreciation in the dollar. The investor will also get the benefit of an appreciation in the dollar, which increases value of Euro investment. We are seeing a divergence in the US and EU economy. The EU is experiencing headline deflation and low economic growth. The US is experiencing a stronger recovery. The US is expected to raise interest rates, the EU may pursue more monetary easing (QE, negative interest rates). Therefore, we would expect to see higher interest rates in the US. In the Eurozone, low interest rates may persist for a considerable time. But, what about the exchange rate? The Euro has already fallen considerably against the dollar in 2015, in anticipation of this divergence in interest rates. It is possible that the Euro could recover some of this loss ground – especially if the Eurozone economy recovers quicker than expected. In this case, the carry trade could be dangerous – a small difference in the interest rates – but the Euro could appreciate and the dollar depreciate. If this occurred a Euro carry trade would not be desirable because you are investing in a declining currency (dollar). But, could the Euro continue to fall? However, if the Euro continues to fall in value, this would make a carry trade very beneficial. If the EU pursues more quantitative easing, negative interest rates, investors may get fed up low rates and look to invest abroad. This search for higher yield will have the effect of increasing demand for dollars and increasing supply of Euros. This will reduce the value of the Euro – increasing the desirability of Euro Carry trade. They expect a gap between EU and US interest to fall. The potential profit / loss of a carry trade can make exchange rates volatile. If US interest rates are higher than EU, then there is an incentive to buy US assets. This causes a rise in the dollar compared to Euro. This rise in dollar makes a carry trade even more profitable – encouraging more to buy US assets and sell Euros. Therefore, it can become self-fulfilling. However, when investors no longer think the carry trade is profitable, they start selling US assets, and the dollar falls. Therefore, investors want to unwind their ‘carry trade’ positions – before they get caught out by fall in dollar. As investors sell dollar assets, this causes a fall in the value of the dollar – making everyone else want to ‘unwind their Euro carry trade’. The secret of a successful carry trade position is to beat the market and anticipate future economic events better than other investors. For example, the market may already expect a gap of 2% between US and EU interest rates. However, if you correctly predict the US economy will be stronger than the market predicts, the gap in interest rates may be bigger and the dollar appreciate even more than expected. In this case, buying dollar assets will be profitable. However, if the market is wrong about future Eurozone growth and the EU recovers quicker than expected, then a Euro carry trade is not a good idea. Hot money flows – a similar concept when investors move money into countries with higher interest rates. Hot money flows doesn’t necessarily involve borrowing money to invest in higher rate economies. Yen carry trade – For a long time, low Japanese interest rates encouraged a carry trade between Yen and US dollar.